Image Comics recently updated its creator contributor list (see below) for the upcoming Where We Live: Las Vegas Shooting Benefit Anthology, a comics volume containing over 70 stories from over 150 different creators. The book will have around 300 pages total with stories (fictional and non-fictional) based on/inspired on eye-witness told by an all-star lineup of comics creative talent and locals in the Las Vegas area. All featured in Where We Line volunteered their time and talent for this project, which will also raise money for the survivors and their families. Curated by JH Williams III, Wendy Wright-Williams, Will Dennis, and Image Comics’ Publisher, Eric Stephenson, one hundred percent of the proceeds for the Where We Live anthology will be donated to an existing GoFundMe campaign for the survivors in Las Vegas. The book will include a variety of perspectives with key themes exploring gun violence, common sense gun control, the value of a compassionate society, mental health stigmatization, aftermath of tragedy and how individuals and communities persevere, and an appreciation of Las Vegas as a vibrant community. 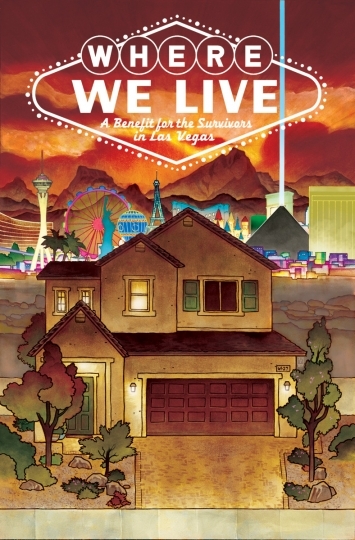 For more info on the Where We Live project, follow the official Twitter page @WhereWeLive_LV, For the the GoFundMe site where all proceeds from the book will be donated, click here.